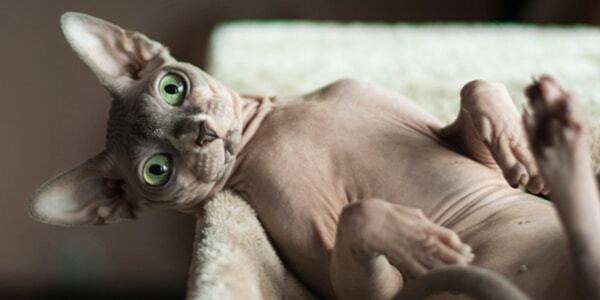 There is one example of a purrfectly evolved cat and that is the Sphynx. Looking at their beautiful, tidy skin one may well wonder: Are our kitties shedding their fur as fast as they can to achieve the same feline purrfection? It would be GREAT if our cats could just keep their fur stuck to their bodies. Until they do though, us guardians are stuck with the problem of never-ending cat fur. Here are five top tips on how to take the fur out of your furball (and clothes, floors, furniture…and basically everything else you own). When you’re at home: Slip into something more comfortable as soon as you in the door. Always wear your home clothes at home and keep your clothes for the outside world separate. Never the twain shall meet. Visiting the outside world: Start a roll down ritual with a tape roller every time you leave the house. A quick once over with these sticky beauties takes 10 seconds and does wonders for your look. You can even create your own roller, using packing tape and that lint brush you’ve never used because lint is not actually the problem…cat hair is! For a more sustainable solution, check out tools like the Furminator hair collection tool – these have great reviews! Pawesome tip: If you are without a sticky roller and have a fur removal emergency, use a damp paper towel (that won’t disintegrate) to wipe down. Delegate the floor work:Get a robotic vacuum! Turn it on and watch it chomp through the tumbleweeds that are furrever blowing down your hallway, while you sit on the couch. Pawesome tip: Robotic vacuums can be expensive to buy new, so check out your local classifieds for a good quality second hand one. Snap on a pair of rubber gloves: This is a handy way to have some cheap de-fuzzing fun! Scrape your furniture down with your rubber gloved hands. The weird rubbery surface of the glove is great for collecting fur from upholstery surfaces. Pawesome tip: Peg the clumps of fur you collect out on the washing line. Birds love to use it for nesting, and will come collect it. Prevention: Reduce kitty’s time on the furniture by giving them plenty of cat-designated places to chill, like a well tucked away cat cave (check out our Kitska caves and beds here). If your cat isn’t repulsed by brushing, you may try doing this regularly. If kitty is shedding an ungodly amount of fur, check in with your vet as stress and medical problems can sometimes be the cause.